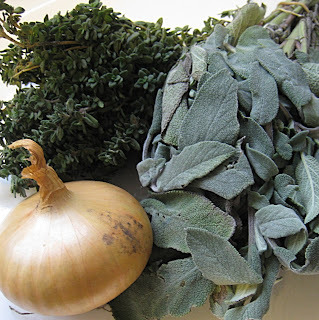 January's pie was brought to you by the flavours of sage, onion and thyme. 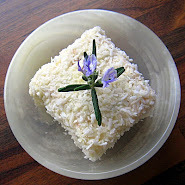 Embarking on a 10-day Re-Inventing the Lamington Challenge is one way to ensure that you don't really have time to think about anything much other than lamingtons, and so as a result, I haven't really. No regrets, mind, I'm just pointing it out. 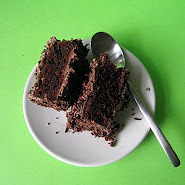 But actually, at the end of December, I was full of ideas that weren't related to day-old cubes of cake, chocolate ganache and coconut shavings at all; I was thinking about pie. 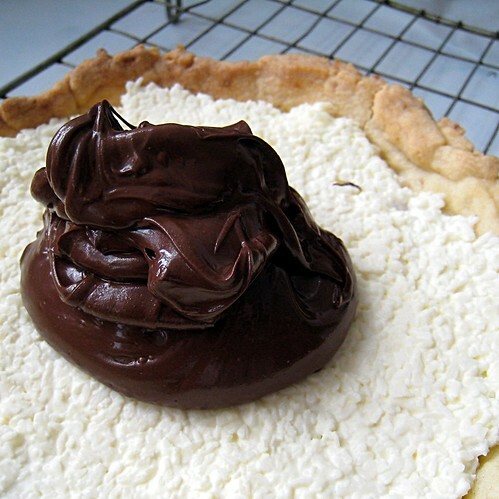 Reader: 2010 was going to be the year of the pie. And so it begins. 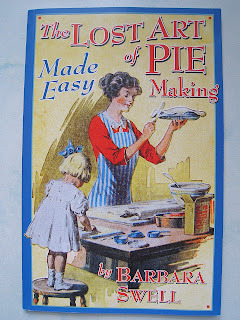 Though strangely enough, not with a recipe from the book that inspired it, though lots of those pies are going to be featured over the course of the year. Some of them have historical connections, and I have never been someone who can resist a meal with a story. Squished together, this looked somewhat less appealing. No, January's pie is all of my own creation. It's a sausagemeat pie, plain and simple, only instead of making regular shortcrust, I decided to branch out. Don't worry though, I didn't go too crazy; it's only rich shortcrust. Rich shortcrust (said the non-expert), is just like normal shortcrust pastry, except bound with egg yolk instead of water. It seems to make a shinier, mealier crust. But you won't be able to tell that because these pictures were taken at the start of January, in awful, dull, wintry light, and a freezing cold kitchen. 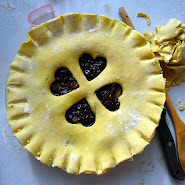 In fact, they are so bad that I wanted to bake this pie again, just to re-photograph it. But it's 31 January today, which means that if I don't post it now, January will be without a pie. And I refuse point blank to let that happen, not for nobody and no how. Next time, I promise to have 'process' photos. The ones I took for this were just too bad to be seen, and you deserve better. But for now, let us be content with these cobbled together shots; they are all we have. *I was considering calling this series Learning To Love Your Nailbrush. He may not look it in dull winter colours, and with the light on, but this pie was beautiful. 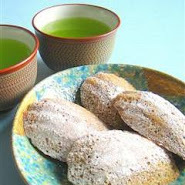 Make the rich shortcrust: rub the fat into the flour, and when the mixture looks like breadcrumbs, stop. Add salt, and the egg yolk. It should come together and form a ball; add a little iced water if it needs help. Wrap in clingfilm, and chill in the fridge for at least twenty minutes. Preheat the oven to 200°C. 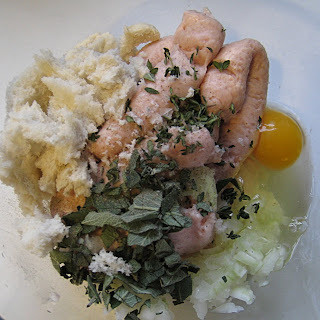 Mix the filling ingredients together in a large bowl. Roll out half the pastry, and line the pie dish. Add the filling. 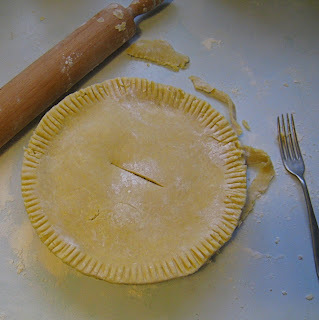 Roll out remaining pastry, and use as a lid for the pie. 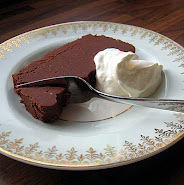 Seal the edges using a fork. 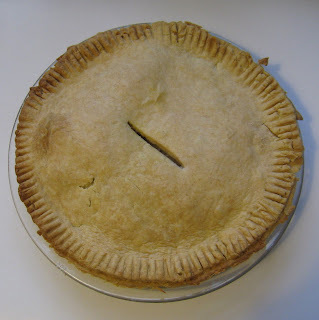 Make a slit on the top of the pie with a sharp knife (to allow steam to escape), and bake for about 40 minutes. Serve hot, or cold. However you eat it it's good; however you look at the photos, they're bad. You'd be smiling too, if you were that close to a red velvet cupcake. It may seem that I've come over all Valentine's and lovey-dovey, so I would just like to clarify up front that this is not the case. 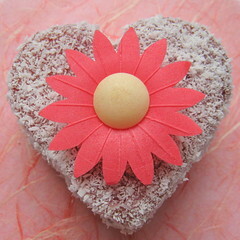 These are not Valentine's Day cupcakes, and nor will they be. Though you could make them for that, if you wanted. Or for any number of occasions. Voluntary Redundancy cupcakes perhaps? No, these are belated birthday cupcakes. Lucy had her birthday last week, and you can't have a birthday without cake. It's the law. Lucy likes red velvet. I know that sounds like the title of some smutty film, but it's true: she told me so. 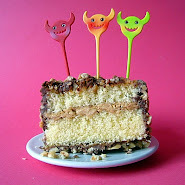 And if you can't have a bit of what you like on your (albeit belated) birthday, then when can you? have been messed about with! I was going to make the recipe from The Hummingbird Bakery Cookbook, which Mr. Other P would have approved of - he loves red velvet too - but have been noticing a new name cropping up all over the Internet recently that seems to be synonymous with red velvet cake: Rose Levy Beranbaum. I don't think you can help wanting to bake the cake recipe of someone with a name like that. And more to the point, my inner baker was desperate to give it a go based purely on the method, which is unusual, or seemed so to me. I lifted the recipe from a website, but am so impressed with the results, and accuracy of the instructions - do what Rose tells you to and follow the times given, and there's no way you could mess this up, even if you'd never baked anything in your life other than potatoes - that I've ordered the book this recipe came from, Rose's Heavenly Cakes. Consider this my recommendation. 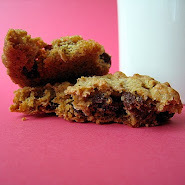 I had to make a few ingredient substitutions though so this recipe is my amended one. A final word, which you can ignore altogether if you want, but I suggest you don't. 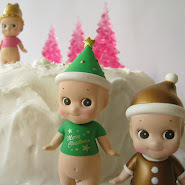 Go easy on the sprinkles and decorations. 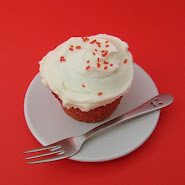 The beauty of red velvet is in the contrast between vibrant, crimson-red cake, and gleaming, fresh, white icing. 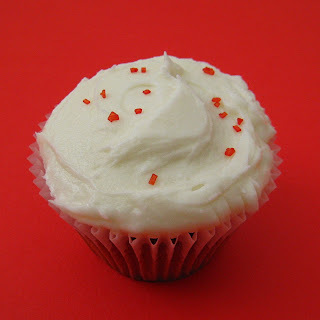 Anything more than a light dusting of red harlequin sugar or hundreds and thousands, and your cupcakes will become little more than the edible personification of that friend you have who always has bad hair, and you never quite have the heart to be honest with. People will tell you they look beautiful, but they won't really mean it. 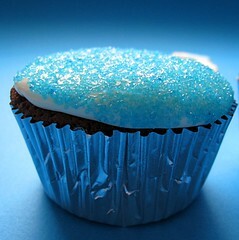 Do you want that for your cupcakes? Preheat the oven to 180°C. Line a 12 bun cupcake tin with paper wrappers (you will actually get 15 cupcakes from this mixture, so may need to bake twice). 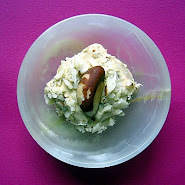 In a mixing bowl, lightly mix together the egg whites, vanilla seeds (or essence) and red colouring. You will be amazed and/or horrified at the colour. 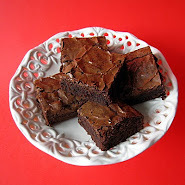 Using an electric hand mixer, in a large bowl, beat the butter and oil together for one minute on medium speed. Add the dry ingredients and yogurt to the butter mixture, and mix together on low speed. Then, when combined, switch to high speed and mix for one and a half minutes. 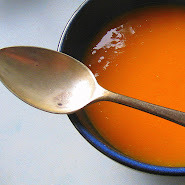 You should scrape down the sides of the bowl to make sure everything is incorporated. Add half of the bloodied egg whites. Mix on medium speed for thirty seconds, and then add the rest of the egg mixture. Mix on medium speed for another thirty seconds. 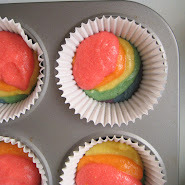 Transfer the batter to the line cupcakes tins, filling each about three quarters full. 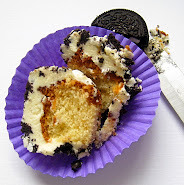 Bake for twenty minutes until a toothpick inserted into the centre of the cupcakes comes out clean. 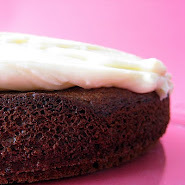 Make the icing: mix the softened butter with the cream cheese, then add the sugar. You might not need it all - stop at the consistency you like. I like it thick and shiny, so add it all. 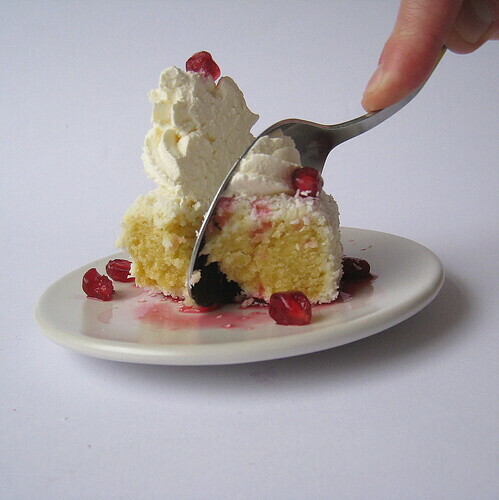 Use the icing to frost the cakes - a palate knife makes pretty swirls. I am so excited to be writing this! When I decided to turn this little challenge of mine into a contest, I had absolutely no idea that so many people would enter. 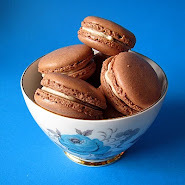 Even those who would not bake at all in the normal run of things have been inspired to get out the eggs, butter, sugar and flour (and they have told me so, in the emails accompanying their entries), and that's what makes this even better - we are officially a baking community. Yes, we are. So, a big pat on the bag to every one of you. I really wish I could have been there with you while you were getting your bake on (nothing like a team bake-off! 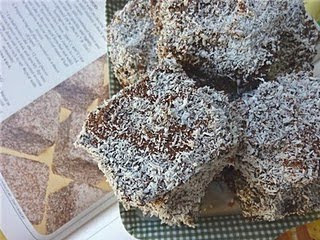 ), even if only to help you clean up the mess; lamington making is not a tidy exercise, as we all now now! Before we get to the good bit (looking at the entries! ), I just want to say a few things about the judging. There is no way that I feel able to do this alone. 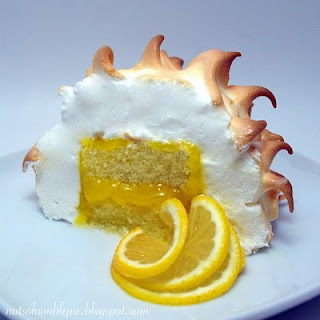 Too many talented bakers have entered, and I can't possibly choose just one of them to win. 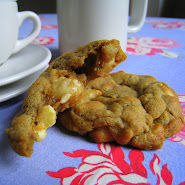 For this reason, I have decided to take a reader poll, and award two prizes instead of one - the first one, the cookie cutter, will go to the entry that gets the most votes (voting begins tomorrow, when I will enable the voting tool - if that's what we're calling it). The second, MYSTERY PRIZE (I have to make sure I can get it before I announce it!) winner, will be selected at random, from the remaining entries. Sorry to remove myself entirely from the judging process, but it's too difficult to choose. You are all winners in my eyes! Do please take a little time to visit each of the blogs mentioned below; these are some very creative types indeed, and you'll enjoy it. And so, without further ado, and in no particular order (save that in which I received them! 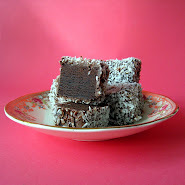 ), I give you the Re-Invented Lamington Hit Parade! 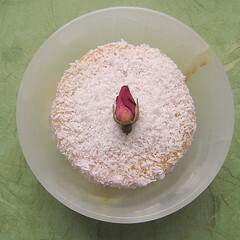 Ms. Humble, of the inimitable Not So Humble Pie, kicked things off with a White Chocolate and Raspberry Lamington. Not only was she first to re-invent, she also did so no less than FOUR times! 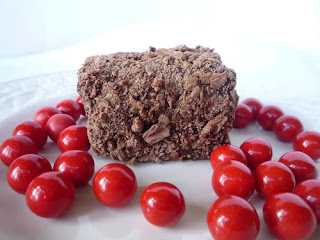 And, a stroke of genius, Bloody, Poofy, Woolly Chocolate Lamingtons. 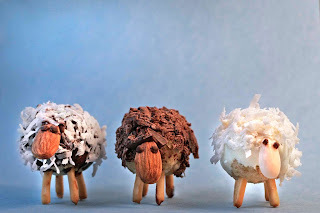 I didn't know about Lisa Randel's blog Sunday Hotpants before this competition started, but have been back so many times since she entered - stunning photos make me want to up sticks and move to NZ, and the design is super kitsch! She was also quick off the mark, with multiple entries (I love a competitive streak!). 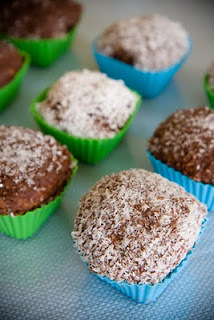 And Double Chocolate Jaffa Lamingtons. Next, a personal favourite of mine (read the accompanying post, you'll see - I love Hubert! 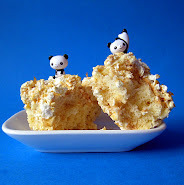 ), Mathea of Peas♥Carrots made super fantastic LAMBingtons. 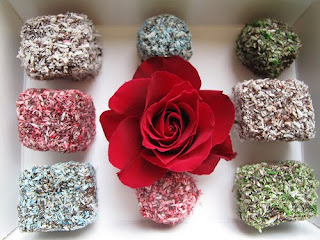 Mathea set her flat on fire making these beauties, so let's all be sending some major lamington love her way. 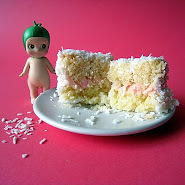 Next, I had an entry from Mowie of Mowielicious. 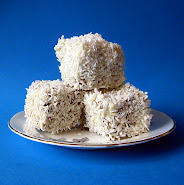 Well, I say 'had an entry' - I actually found his lamingtons by happy coincidence while on a web-trawl. But he kindly agreed to enter them at my request, so you can all enjoy the beauty of his pictures. 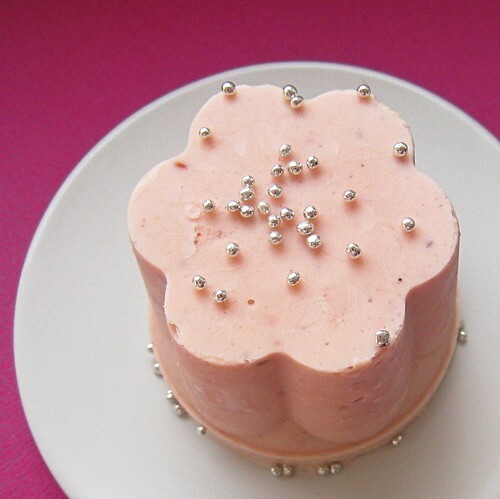 And he made a génoise cake for the base, which is more than I did! And now you'll have to forgive me while I gush for a little bit. 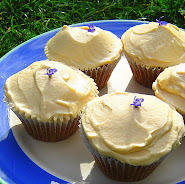 The first blog I ever read avidly was, unsurprisingly, a baking blog. 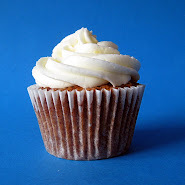 I have baked dozens of the cupcake recipes featured on its pages, and still, four years after first discovering it, I am positively replete with admiration for the abilities of its creator, Cheryl Poro. 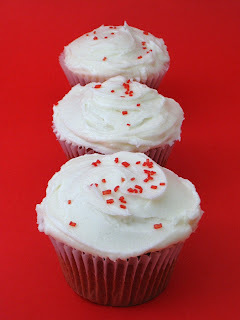 I'm talking about cupcakeblog.com (you knew that!) of course, and guess what? 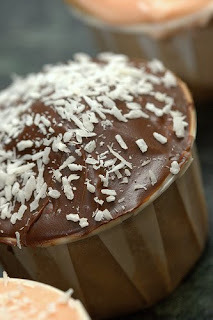 Cheryl made lamington-inspired cupcakes! I emailed, begging and pleading with her to enter, and she agreed (I reckon the Cardiff connection swung it!). 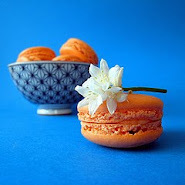 Talking of cool premises for a blog, I suggest you have a look at A Delicious. 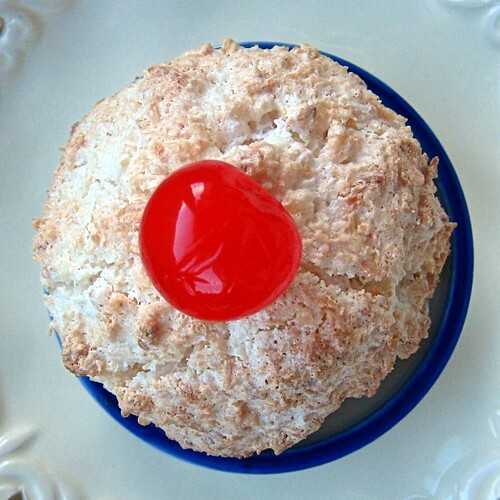 Year - Krista, it's creator, has also made lamingtons, and in Australia-themed shapes no less! 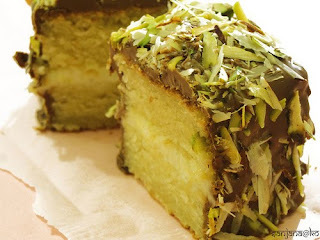 Lots of bloggers said that they didn't know what lamingtons were until I set this challenge. 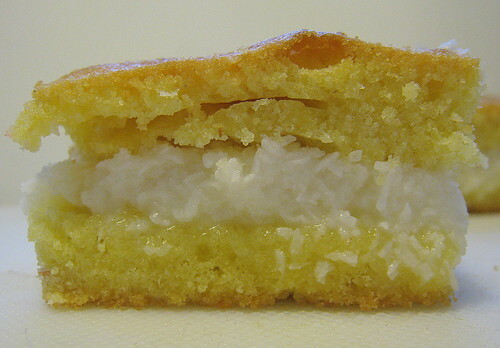 Well, I didn't know what a wattle was until Cakelaw, from Laws of the Kitchen, posted her lamingtons and photos. *spoiler* The golden wattle is the national flower of Australia! 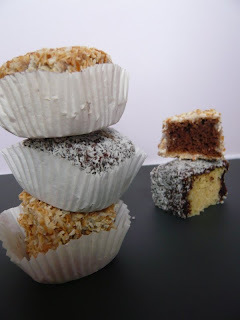 The Curious Baker has made some very curious lamingtons indeed - inside out, and gluten free to boot! Brilliant stuff. Mardi at Eat, live, travel, write really went to town with the re-invention. 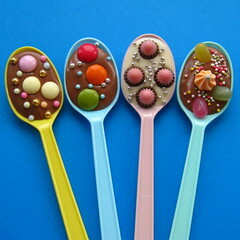 Look at these! 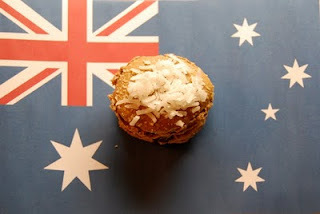 And I love the photo - Australian flag gets extra points! Now, of all the entries I've had (and as you can see, there are rather a lot! 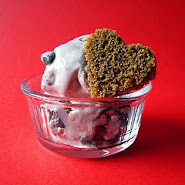 ), the one I think I most want to take a bite of is this from Sanjana. 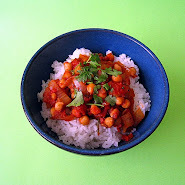 I love her blog anyway - I'm never buying an Indian cookbook ever again - but these made me love it a whole lot more. Just imagine the flavour in this! Silvermoon Dragon of Dragon Musings made a real doozy. 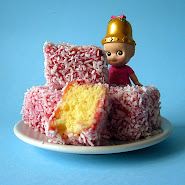 Check out the colours on her lamington! I loved it. And, although she doesn't have a blog herself, Silvermoon's sister, Jacqui, also entered. 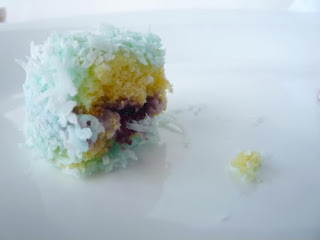 She made sparkling pineapple-lime jelly lamingtons. I repeat. Sparkling. Pineapple-Lime. Jelly. 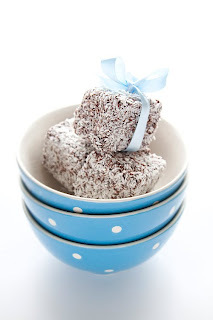 Lamingtons. 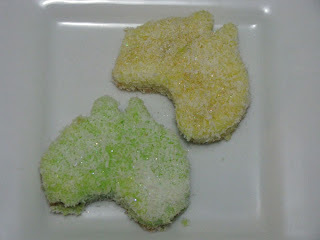 I'm glad it isn't just me who loves sparkly (Australia-shaped) food! 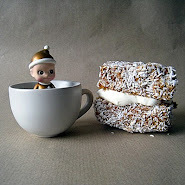 Finally, though amazingly, Ozoz, the wonderful Kitchen Butterfly made Lamingtons à la fondue. What an idea! 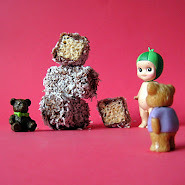 Let everybody make their own lamington mess to tidy up! 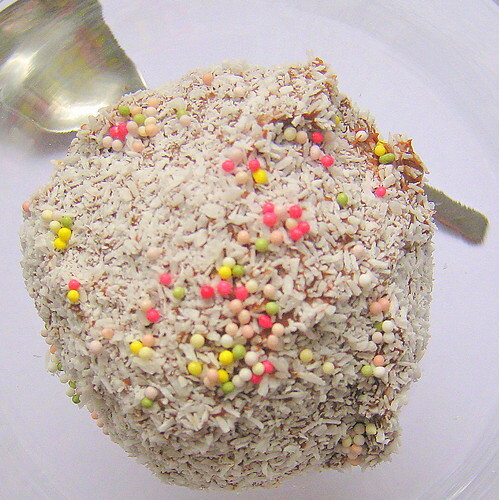 And that's the Re-Invented Lamington Hit Parade 2010. Wasn't it fantastic? Why not take another look? Remember, you can't vote yet. I'll be posting the poll tomorrow (my mum's here and I'd rather spend a little time with her than sort out this poll thing right now!) - this is just so you can have a little extra time to think about which way you'll go. Bad news: This is taking longer than expected... It might be tomorrow before I post. Good news: LOADS of good entries! A nod to our friends enjoying the Australian Summer. 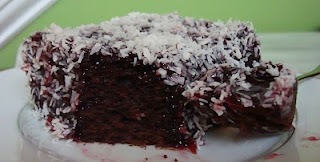 I did say that not all my lamingtons had to be cake. But I know this is quite naughty even by my standards. 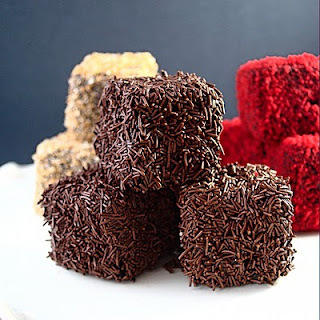 Nevertheless, when re-inventing the lamington, I have allowed myself to be inspired by traditional lamingtons, but also the freedom to play with the formula a little. So while this is undoubtedly more of a dessert... I'm allowing it into the challenge. Also, I have just had a roster change at work, and so don't have time to bake any more. 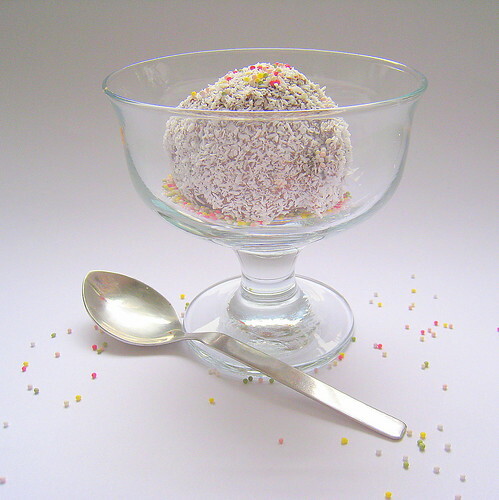 Scoop balls of ice-cream onto a cling film lined plate or baking tray, and freeze until very hard (at least an hour). Melt the chocolate, and cool slightly. 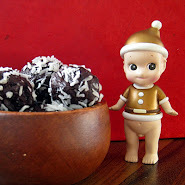 Put the coconut into a bowl, and do the same with the hundreds and thousands. 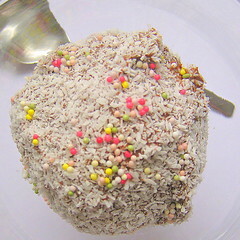 Impale each ice-cream ball on a fork, and dip into the molten chocolate, followed by the coconut and then the hundreds and thousands. Well, I am and, what's more, I can. 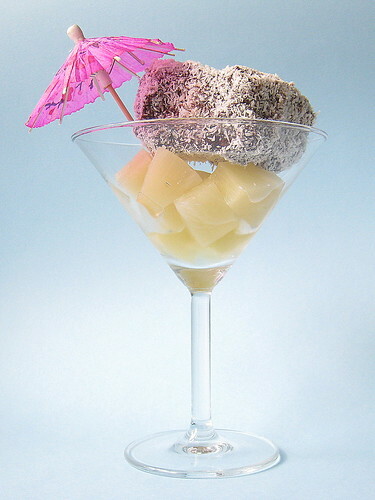 I'm almost ashamed to say it, but when I first became a legal drinker, my tipple of choice was pina colada. I didn't really like taste of other alcoholic drinks, and was always (am still) drawn to the kind of drink that comes with an umbrella hanging out of the glass. What I must have looked like... In fairness though, I wasn't alone. A group of us sixth formers would always go for cocktails on Fridays. Of course, this was all years ago, and whereas you'd now most likely find me nursing a pint of creamy ale (forced attendance at CAMRA beer festivals on more than one occasion has changed my palate somewhat), I still have fond memories of those yellow drinks. I wonder what CAMRA would make of that? 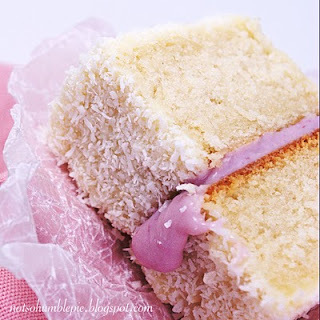 When I was making the Cherry Ripe Lamingtons, I suddenly thought about Pina Coladas, and how I hadn't had one in a long time. And that was it. They cried out to be made. In fairness, they aren't as much of a success as the Cherry Ripes. 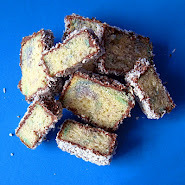 The pineapple flavour is hard to detect, and I'd drench the cake cubes in the juice from the pineapple tin if I made these again. In fact, I would probably use fresh pineapple. Even so, I liked these a lot. 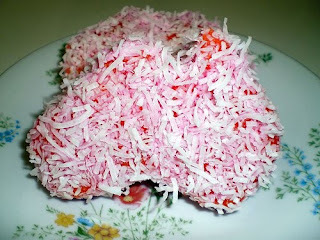 Fun lamingtons, and good memories of times gone by! 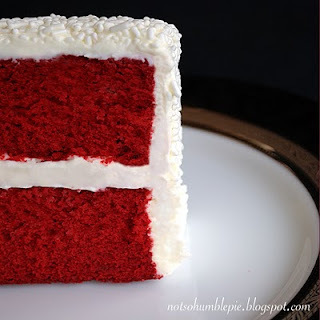 Cut the cake into 16 squares, and slice each in half horizontally so as to make thin sandwiches. Mix half of the coconut with the icing sugar, 50ml cream and the chopped pineapple cubes. 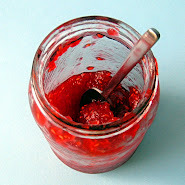 Add some juice too, to make a thick paste. It won't be brightly coloured, but you could add yellow colouring if you like. I didn't. Stand on a wire rack to set for an hour or so. 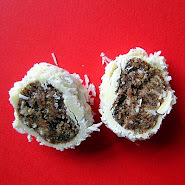 It's not in the photographs, but we had these with a scoop of ice-cream, and it was a good move. 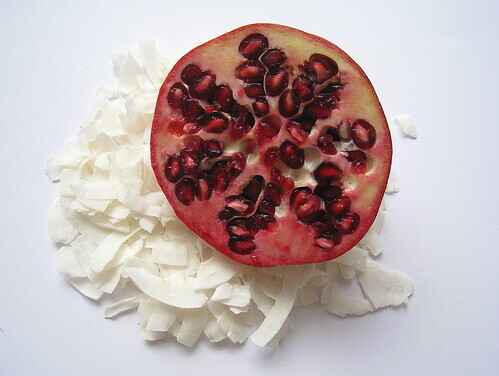 Coconut and pomegranate: new best friends. 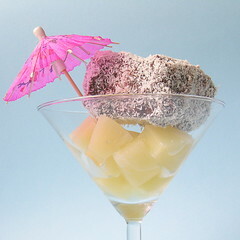 I confess: these were supposed to be White Chocolate and Passion Fruit Cream Lamingtons. 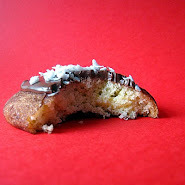 They were the lamingtons I had been looking forward to making since the very beginning of this challenge. When Mr. Other P and I were on our Australian jaunt, we'd feast every morning on plates of the freshest, sweetest locally grown fruit you could ever imagine. Watermelon, grapes, pears, berries, you name it, we ate it. 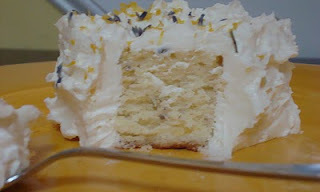 And always the same way - with a topping of aromatic passion fruit pulp and thick, creamy yogurt. They really do have amazing food Down Under, and especially fruit. When we got back, my passion fruit and yogurt addiction reached fever pitch, and so I knew I wanted a passion fruit lamington in here somewhere. But could I get any of these wonder fruits? Curses, no. This is not to do with seasonal availability - apparently the snow we've been having has meant lots of fresh produce deliveries are not making it where they need to get to. So I went with what I could get: pomegranates. I don't want to make it sound like a poor man's version mind you. 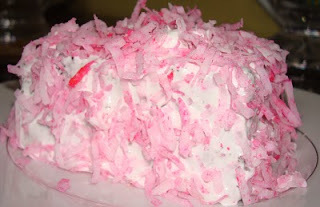 This is definitely in my top 3 of the lamingtons I've made (along with the PBJ and Purple Rain varieties). The juice from the pomegranates sinks into the white chocolate coated cake cubes and turns them an incredible shade of crimson-magenta. And they do say you eat with your eyes. 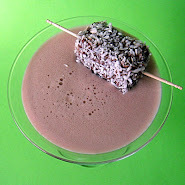 The juice is fairly astringent as well, so it cuts through the sweetness of the chocolate and the fatness of the cream quite nicely. I must apologise for the photos - there was horrible light when I was taking the pictures, right before Mr. Other P got home from work (that's him eating the lamington), and I have never before piped cream. I probably won't again either - dollops are prettier. The method here is a bit unusual - not that any of my lamingtons have been usual - in that I plated up the lamingtons right before we ate them for desert. 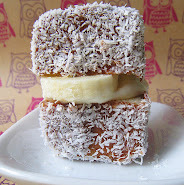 So what we're talking about really are fancy-pants dessert lamingtons. Good enough for me! 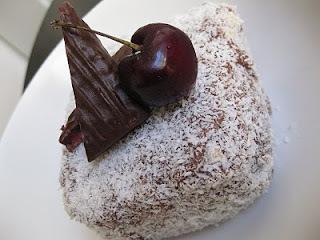 There's something beautiful about seeing a lamington being devoured! 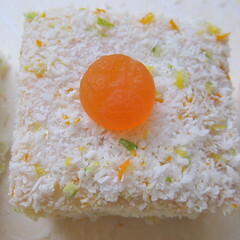 Cut the cake into 6 large cubes. 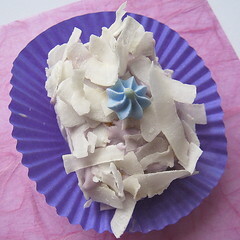 Melt the white chocolate and put the coconut into a shallow dish. 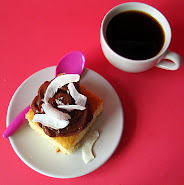 Dip the cake cubes first in chocolate and then coconut. Set to cool on a wire rack. 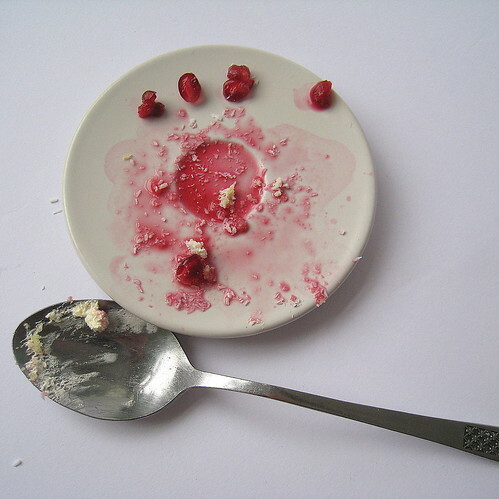 Half the pomegranate and extract the seeds from one half. Set these aside. 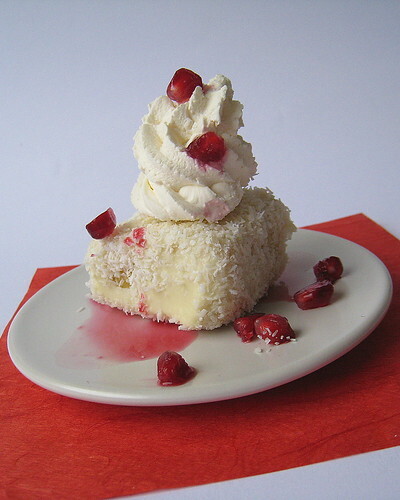 To serve, top each lamington with a dollop of cream, and a scattering of red pomegranate seeds. Juice the other half over the lamingtons.